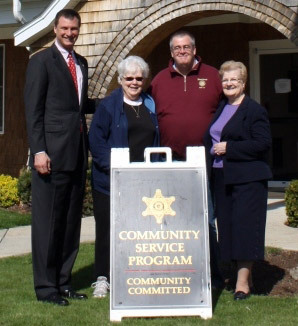 The Worcester County Sheriff’s Department Community Service Program provides cost-free labor by minimum security inmates who have been convicted only of a non-violent offense, are within the final 6 months of their sentence, and have a spotless record while incarcerated. The only cost to the host organization is materials for the project, and lunches for the work crews. Inmates are monitored at all times by an armed Officer, and routinely complete work in many different areas, including: carpentry, demolition, painting, landscaping, snow removal, floor tiling, and much more. We likewise benefit by teaching our inmates a valuable and marketable skill that will reduce recidivism and offer a mean of being productive member of society. I want to extend our thanks for the work recently performed by your Community Service team at several of our recreational fields. While in town, the teams cleaned and raked several playgrounds, excavated footings for the installation of a batting cage and painted a pair of ball field dugouts and a snack shack. This work was done quickly, efficiently and with very professional results. This is an excellent program that provides both an opportunity for your inmates to be productive and contribute to society and provides communities with services they may not otherwise be able to afford. Hubbardston Youth Baseball just finished another season with your program and it went off without a hitch! With volunteer time at such low levels, this program was invaluable to a small community non-profit program like ours. During these difficult economic times, as a non-profit with little money for landscaping and painting, it was a great benefit to have the work crew from the House of Correction accomplish these tasks. We would not have been able to accomplish all this work by ourselves. Thank you so much for coming out and having a crew do such an exceptional job of painting our dining facility. Everyone who comes in is in awe of the beautiful job you crew did. "This program is a valuable asset to the shelter, and to the community. We are always in need of this program to help us with various maintenance projects at both of our facilities. Their work here has helped to improve the look of our building and save us a great deal of our limited funds." Your Community Service Program is certainly an asset to all who are lucky enough to utilize it. I thank you for providing the manpower to assist us with completing this project despite the current economic challenges. The work was completed in a professional and timely manner with considerable savings to the district. Without your assistance, it would not have been possible for our maintenance staff to complete this work along with their other summer projects. his program is a valuable asset to the shelter, and to the community. We are always in need of this program to help us with various maintenance projects at both of our facilities. Their work here has helped to improve the look of our building and save us a great deal of our limited funds. Sheryl BlancatoDirector, Second Chance Animal Shelter, Inc.